Please join us for an exhibition of works from established and emerging architects, internationally and locally, which addresses questions of departure and return, for Architecture Week 2013. 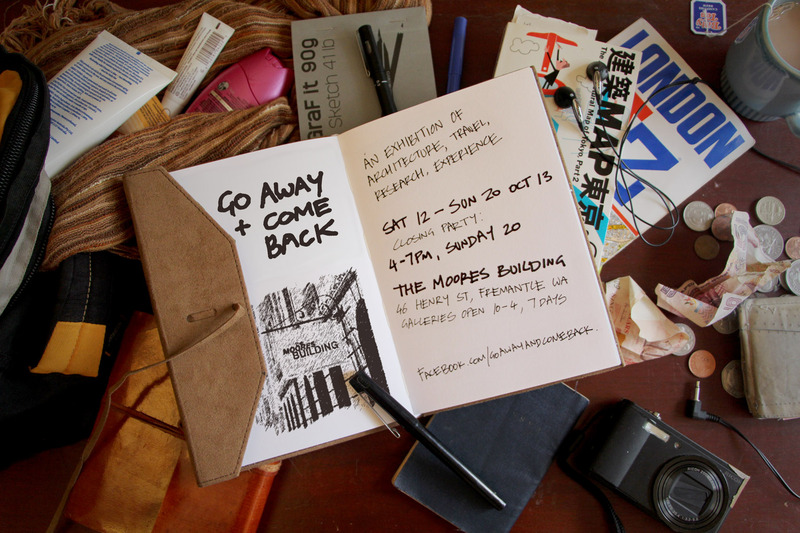 In our contemporary, globalised and mobile world, Go Away and Come Back: an exhibition of architecture, travel, research, experience challenges assumptions about both travel and architectural research through grounded enquiry, diverse reflection, and engaging mediums. Exhibition: 12-20 October 2013. 10am – 4pm, 7 days. Closing Party: Sunday 20 October, 4-7pm. Light snacks. Venue: The Moores Building, 46 Henry Street, Fremantle. Eva Prats and Ricardo Flores, Barcelona; Mimi Cho; Lynn Churchill; Ryan Dunham; Lucy Fuchsbichler and Hannah Gosling; Amanda Hendry; Alexandra Mackenzie; Lara Mackintosh; Sarvenaz Norouzy; Mike Phillips; Adam Reynolds; Jane Samuels; Simon Venturi; Shane Winter. Robyn Creagh and Shannon Lyons. Who’s says there’s nothing to do in Perth? !